Wealthier nations, which offer means to their citizens, higher quality of education, and happen to be less religious, embrace higher public support to evolution (70% and up) than their counterparts at the bottom of the spectrum. Exceptions, like the U.S., where acceptance of evolution is low for its level of wealth (≈40%, measured as function of per capita gross domestic product, GDP), can and do occur. The U.S. is exceptionally religious for its level of economic prosperity in contrast to other highly developed countries. And higher religiosity correlates with lower public acceptance of evolution. Improvements in levels of economic prosperity, therefore, should translate into a nation’s generalized progress, particularly in education. 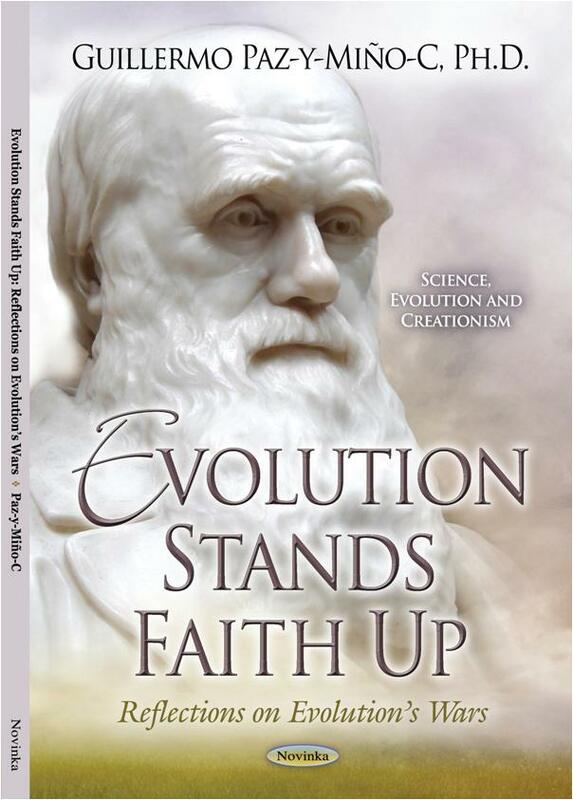 High-quality science/evolution schooling should lead students, parents-to-be, and ultimately the general public to support science/evolution; but keep in mind that if religiosity remains high, it shall continue to correlate with opposition to evolution. Worldwide, there is a positive association between level of education and acceptance of evolution. In the U.S., for example, public support to evolution increases from the high school (21%), to the some college (41%), college graduate (53%), post-graduate (74%), and university professor levels (95%). Note that educational attainment, like overall wealth, also correlates positively with per capita GDP. In the future, we can only expect significant increase in evolution’s acceptance in nations that improve —and sustain the improvement during several decades— their school life expectancies to 15-to-20 years (i.e. college and university education). Keep in mind, however, that in most countries the average general public still remains at the level of high-school or some-college education, which suggests that major progress in the mean-value of public support to evolution shall be achieved chiefly via quality high school —science/evolution— education. In other words, major contributions to increasing evolution’s acceptance nation-by-nation shall mainly come from meaningful improvements to the excellence in high school schooling (i.e. still the prevalent 10-15-year school life expectancy in most countries), rather than from recruitment of tertiary educated professionals (colleges/universities) from the global pool. Of course, good science/evolution education cannot occur in isolation, both depend on schools offering good-quality general education –possibly under a liberal-arts-and-sciences format. Science and evolution knowledge have a negative association with religiosity; both decline with increasing religious beliefs, as documented for New England researchers, educators of prospective teachers in the U.S., and New England college students (a-b). Note how evolution knowledge increases with increasing science knowledge in the three groups (c), a positive association of variables. This is a complex topic. In the book we start this section by highlighting that migration can stimulate the integration of ethno-cultural diversities and increase wealth and prosperity (particularly in science and technology –although not restricted to them), but it can also generate societal tensions, segregation of migrants, exploitation of their labor, inequality and poverty. In scenarios in which the nature of immigration/emigration changes significantly the cultural-demographic composition of a nation (e.g. in the book we contrast Spain versus the U.S. and make projections about future rates of public acceptance of evolution in both countries), attitudes toward evolution and acceptance of evolution could be influenced by the migration process. Alternatively, in scenarios where immigration/emigration do not influence considerably the in-house cultural-demographic composition of a population, we shall expect minor, or no fluctuations in the public support to evolution associated with migration. But, again, in Chapter Nine we are cautious about these generalizations and clarify that: “…the societal struggles around evolution’s acceptance [are] multi-factorial… including the variables: (1) religious beliefs, pro-life beliefs and political ideology; or (2) political activity, political and religious conservatism, knowledge about evolution and its relevance, creationist reasoning, evolutionary misconceptions, and exposure to evolution; or (3) religious affiliation, frequency of attendance to religious services, college academic level, exposure to evolution in high school, and college major…” These factors have been comprehensively analyzed in the literature. What we do in Measuring the Evolution Controversy is to associate these variables to diverse contexts of human migrations and, for that, we compare Spain and the U.S. The U.S. will experience substantial population growth during the next forty years, from 310.4 million, in 2010, to 394.4 million by 2050 (a 21.3% increase). The current Christian majority will decrease by 2050 (from 77.4% to 65.8%) and the unaffiliated will increase during the same time period (from 17.1% to 25.6%). The fertility rates (2010 – 2015) will continue to be higher among the religious vs. the unaffiliated (Muslims 2.7, Christians 2.1, Hindus 2.1, Buddhists 2.1, Jews 2.0, and unaffiliated 1.6). The U.S. shall become less religious primarily due to the rise of the unaffiliated. Thus, public acceptance of evolution —excluding humans— will increase in the U.S. above its current ≈40%. In Chapter Nine, we examine how, by 2050, the world’s religious profile will be driven, primarily, by differences in fertility rates, the proportion of youth among the religious populations, and by people switching religions. Something not unusual since these factors are at play constantly, but we examine how the phenomenon of the evolution controversy shall take place —by 2050— in a different global demographic and religious landscape, or landscapes, than today’s. 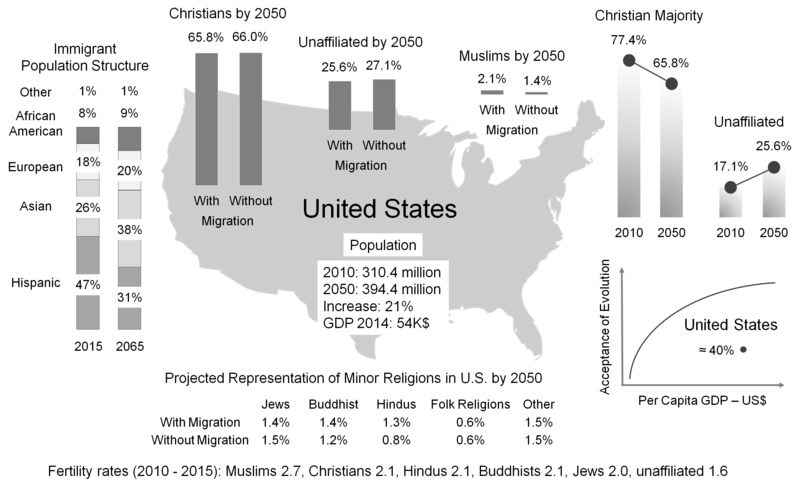 For example, based on data gathered by the Pew Research Center, we explain that although by 2050 Christians will continue to be the largest group (expected growth from 2.17 billion, in 2010, to 2.92 billion by 2050), Muslims will be growing faster than all major faiths (from 1.6 billion, in 2010, to 2.76 billion by 2050). These trends shall lead to different interaction dynamics, than today’s, among world citizens affiliated with religious groups, which future representation in the global population will change rapidly. In addition, we also point out that the unaffiliated (i.e. not associated with formalized religions, agnostics, non-believers or atheists –whose support to evolution is usually the highest) will increase worldwide by 100 million during the next four decades (from 1.13 billion, in 2010, to 1.23 billion by 2050). However, their representation in the world population shall decrease (from 16.4%, in 2010, to 13.2% by 2050) due to the faster population growth rate among Christians and Muslims in respect to the unaffiliated. In the book, we use these statistics, as well as data about evolution’s acceptance by the diverse religious denominations (consistently less accepting of evolution than the unaffiliated), to envision possible scenarios in which the evolution controversy will take place. The statistical future may not be as promising as it may seem today. Although in some nations, like the U.S., public acceptance of evolution shall increase (parallel to a rise in secularization), in others the opposite could probabilistically happen. The book examines this. We end Chapter Nine by reexamining acceptance of evolution in the context of the Incompatibility Hypothesis (IH — the conceptual foundation of the book, which is introduced to readers in Chapters One and Two) and by linking IH to two additional theoretical frameworks: the secularization hypothesis (i.e. the idea that, over time, science and reason will replace religion and faith, or that modernization, which includes human development, will lead to a decline in the belief in supernatural causality) and the religious market models (i.e. the raw supply and demand of anti-evolution beliefs in the market-landscape of ideas). These conceptual frameworks are intensely debated by scholars, something we examine succinctly in the book. But that is material for a future post. — GPC — EvoLiteracy © 2016. 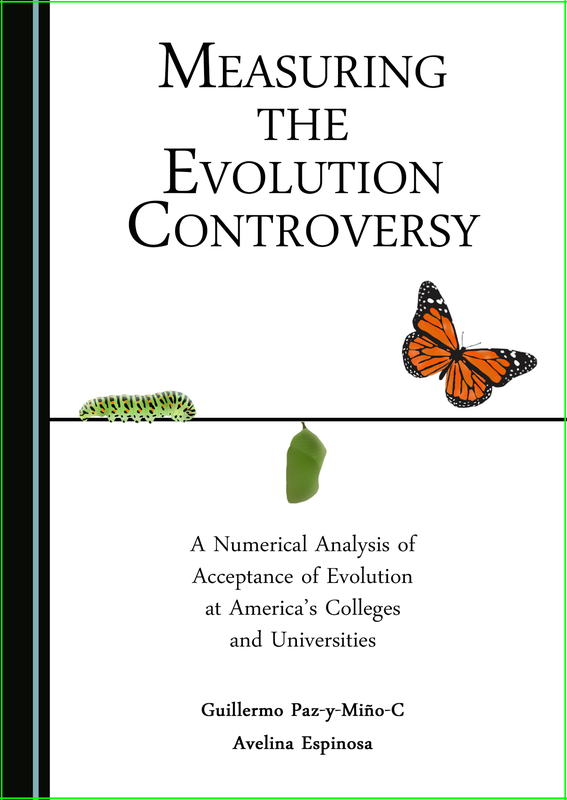 ABOUT THE BOOK – Measuring the Evolution Controversy, a 210-page hardback volume (>100 data figures, maps, tables and explanatory boxes), can be ordered directly from Cambridge Scholars Publishing, Amazon US, or Amazon CA . The publisher has made available a “VIEW EXTRACT” (in PDF), which includes the first 30-pages of the book: Cover, Table of Contents, Acknowledgments, Preface, Chapter ONE and the beginning of Chapter TWO. For PDF of color illustrations go to Image Resources of Didactic Relevance.